Think you have nothing to fix for dinner? As long as you have a few potatoes in the pantry, you have at least one option—bake potatoes and call it dinner. Whether topped with a pat of butter or loaded up with broccoli and cheese—or a big scoop of hearty chili—baked potatoes really are an easy, no-brainer meal. The bonus is that potatoes are both nutritious and cheap. While you can bake just about any kind of potato, Russets are the best option. The skin on a Russet is thicker and the starchy inside has a sweet flavor that gets extra fluffy while baking. Russets are typically larger, which makes them ideal for a dinner entree. 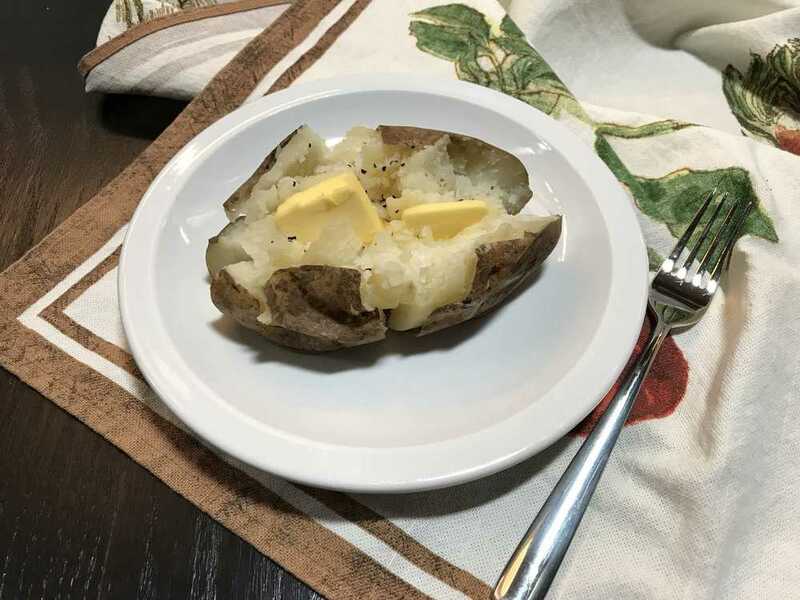 Here are four easy ways to prepare baked potatoes—in your Instant Pot, in the oven, microwave, or slow cooker. 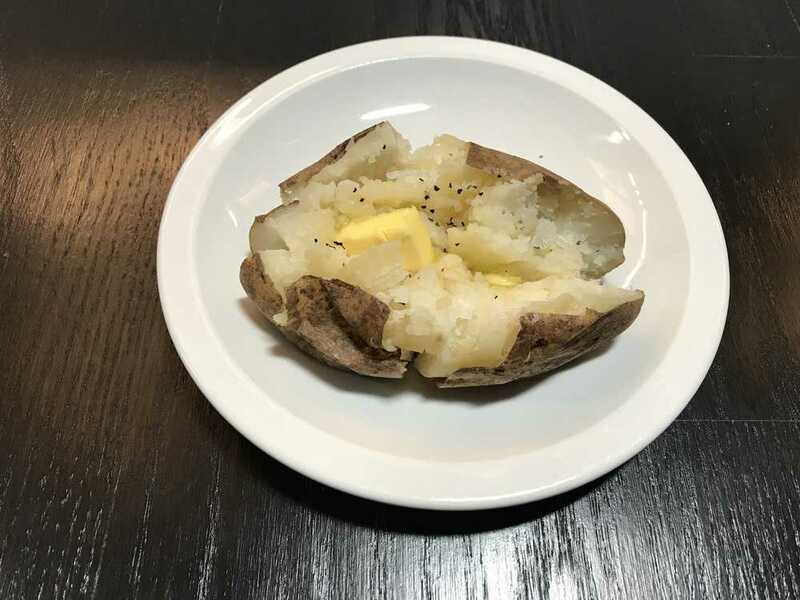 Without a doubt, this is my favorite way to prepare baked potatoes. I’ll admit I was hesitant at first, assuming the potatoes would come out wet and drippy. Nothing could be farther from the truth. I followed these directions, and nailed it, the first time! These instructions are for cooking 4 to 8 medium-sized Russet potatoes at a time (the size the typically come in a bag and pictured here) in a 6-qt Instant Pot. 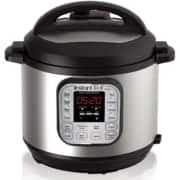 Once you understand the process, you will be able to adapt to your size Instant Pot and the number of potatoes you wish to “bake” at a time. RELATED: Highly Useful Accessories are the Secret of Instant Pot Rockstars! Wash the potatoes well. No need to dry. Set the trivet that came with your Instant Pot into the cooking pot, making certain the little “legs” of the trivet are pointing down. Pour 1 cup cold water into the Instant Pot. Place potatoes on the trivet. If cooking 6 or 8 just go ahead and stack ’em up. Apply the lid, moving the valve to the sealing position. When done, allow pressure to release for 8-10 minutes, then release any remaining pressure. This method produces a perfectly baked potato. If you prefer a crispy skin, once finished cooking, brush the potatoes with olive oil and sprinkle with sea salt and pepper. Set in 400F oven for 10 minutes. These times are approximate and should be adjusted accordingly. If the potatoes are not quite as soft as you desire, you can reset Instant Pot for a few more minutes. Another thing is the altitude. I live at a relatively high altitude, so I add 3 to 4 minutes to the times above. Preheat oven to 425F. Wash and dry the potatoes. Rub with olive oil and sprinkle with salt and ground black pepper. Poke holes all over the potatoes 6 to 10 times with the tines of a fork, to allow steam to escape during the baking process. 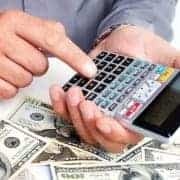 Skip this step and you may have to deal with a messy situation. Lay the prepared potatoes directly on the oven rack or on a baking sheet. 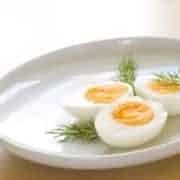 Bake for 55 to 60 minutes, or until the skins are crispy and poking with a fork or the tip of a knife does not meet with resistance. Crispy, delicious potato skin with a fluffy, pillowing interior. Want softer skins? Wrap the potatoes in aluminum foil prior to placing in the oven. If you prefer the traditional method of baking potatoes for up to one hour, but don’t have that much time, prepare the potatoes then microwave them for 3 to 4 minutes. Now place them in the 425F oven to finish. Start checking after 20 minutes because you do not want to overdo it. This will produce crispy skins with soft and fluffy interiors in half the time. You’ll get optimum results if you microwave no more than two potatoes at a time. 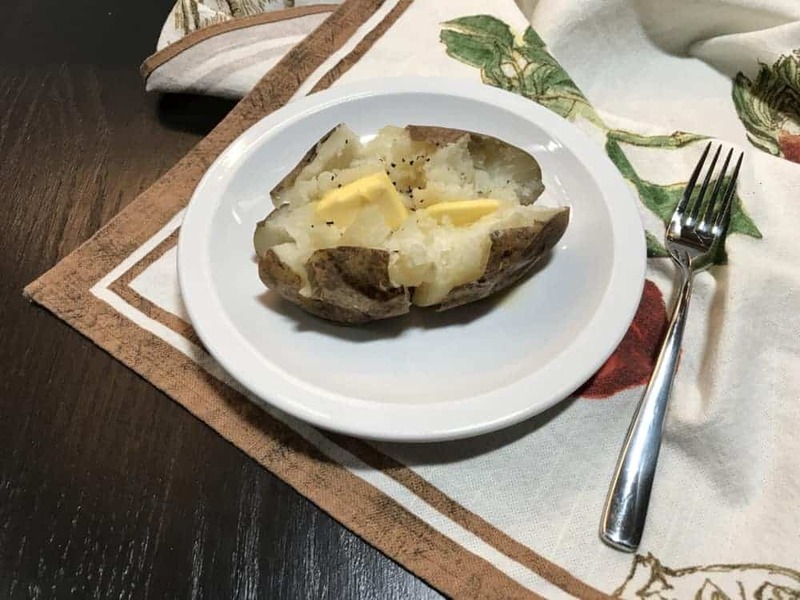 Follow the same prepping instructions as for oven-baked potatoes—wash, dry, poke with a fork all over each potato 6 to 10 times, rub with olive oil and sprinkle with salt and ground black pepper—then place the prepared potatoes in a microwave-safe dish and pop them into the microwave. Cook two potatoes on full power for 5 minutes. Turn them over and microwave for another 3 to 5 minutes. If still hard in the middle, microwave for additional 1-minute bursts until cooked through. Soft skins but super fast cooking. Prepare clean potatoes with olive oil, salt, and pepper and prick them as above. Wrap each potato in foil and lay it in the bottom of your slow cooker. It is okay to pile them up if you are doing multiple potatoes, but slow cooker should be no more than 3/4 full for optimum results. Place the lid on the cooker and set it to Low for 8 to 10 hours. Soft skin potatoes that are evenly cooked throughout and ready the minute you walk in the door. If you prefer the traditional method of baking potatoes for up to one hour that produces crispy skins, but don’t have that much time, prepare the potatoes then microwave them for 3 to 4 minutes. Now place them in the 425F oven to finish. Start checking after 20 minutes because you do not want to overdo it.